We love it when customers send us pictures of their completed projects. Check out these photos from Chris and Nina E. in Bermuda. 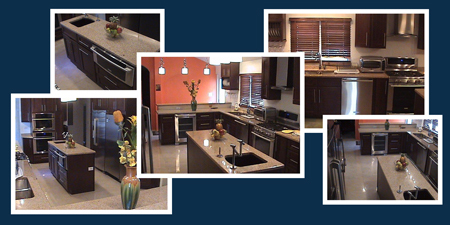 They chose beautiful, all wood Shiloh cabinets with sleek, smooth granite countertops. I thought you'd like to see some pictures of our brand new kitchen, thanks to Global Sales. Thanks Jeff, David, Julie, and all who were involved in making our dreams and vision come to fruition. Send us pictures of your project - in progress or completed - and we'll share it on our website!